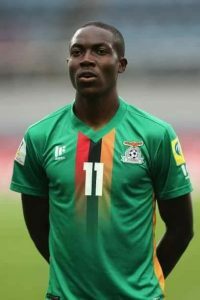 Austria based midfielder Enock Mwepu has joined the Zambia national team camp in Accra Ghana ahead of Saturday’s crucial Russia 2018 FIFA World Cup Group B match against Nigeria. Team Manager Chris Chibuye confirmed to Fazfootball from the team base in Accra that Sweden based Edward Chilufya will not be part of the team as his work permit matters were yet to be finalized after signing a contract on turning 18 years. Mwepu, who stars for FC Liefering in Austria closes up the number of foreign based players with the exception of Patson Daka who will join the squad in Abuja on Wednesday. All but two of the nine foreign based players summoned to camp have joined giving Wedson Nyirenda enough time to work with his arsenal. The team will head to Nigeria tomorrow (Wednesday) ahead of Saturday’s clash. The Super Eagles lead Group B on 10 points while Zambia is second on seven points with Cameroun standing third on three points. Algeria is at the bottom on one point.